Glucaric Acid Market size is set to surpass USD 440 million by 2024; according to a new research report by Global Market Insights, Inc. Growing consumer awareness for chemical free detergents owing to concern for aquatic life as detergents containing phosphate create algae blooms in fresh water blocking oxygen from mixing with water while harming the environment thus, driving glucaric acid market growth. Increasing consumer purchasing power and acceptance for premium natural products may boost industry growth. Global potassium sodium glucaric acid market size is anticipated to surpass USD 155 million in the estimated timeline. Rising awareness regarding the importance of product in preserving the levels of essential nutrients in human body has resulted in its higher consumption in daily meals, which has played a vital role in stimulating saccharic acid industry growth. Government guidelines supporting the utilization of organic components in detergents, food ingredients, corrosion inhibitors, and deicing agents is likely to promote product demand. Encouraging initiatives from EU, FDA and EPA pertaining to environment and use of safe chemicals will be a crucial influence towards the development of glucaric acid industry. India glucaric acid market size from food application may witness gains up to 11% in the estimated timeline. The product is widely used in applications relating to food industry to enhance the levels of vitamins and minerals in body, protecting vital organs including lungs and liver thus, promoting product demand. New product inventions and demand for natural and organic components in cleaning products is forecast to stimulate saccharic acid industry size over estimated timeframe. Escalating economic standards with rising awareness about ecosystem is likely to boost glucaric acid market growth. Detergent manufacturers are replacing synthetic constituents including phosphate with effective and safer product like calcium D glucarate and potassium sodium glucaric. Through the banning of phosphate substitutes, consumers are purchasing the product which is non-toxic in nature, which may favor saccharic acid market growth. Cost concerns regarding natural components due to heavy capital investment in production process may distress glucaric acid market price trends. Increasing price of raw material can incur further compliance cost, which may hamper industry profitability. Germany glucaric acid industry size is anticipated to surpass 11 kilo tons due to its utilization in corrosion inhibitors and food ingredients. It is an influential corrosion inhibitor and can be utilized in applications where water contacts metal surfaces. Manufacturers have found the product valuable in varied products from domestic cleaning to cooling tower treatment programs to concrete mixtures thus, enhancing market growth. China glucaric acid market size may witness strong growth of over 9.5% in projected timeline due to increasing soap & detergent and food & beverages industries size which are major end-use sectors for market, thus stimulating regional product demand. 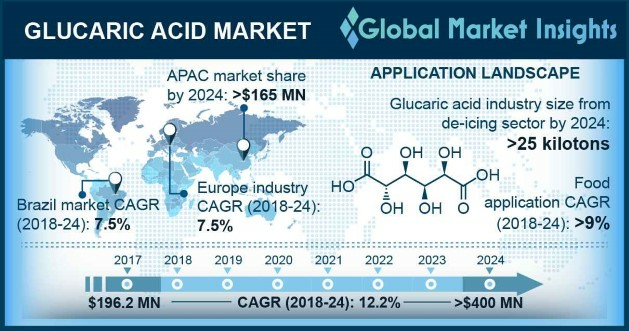 Glucaric acid market is competitive and consolidated with key industry participants including Rennovia, Alfa Chemistry, Haihang Industry, and Kalion Inc. Increasing consumption of organic components has encouraged manufacturers to intensely invest in R&D for making effective products. Companies are investing heavily on product design, innovation, manufacturing phases, and commercialization.